My Name Is Not Bob: Is Writing Worth Pursuing? Many writers either ask me the question above, or if they're getting frustrated about their lack of progress in "hitting it big," they say something like, "Sometimes I wonder if writing is even worth it." Before I get into how I would answer that question, I'd like to tell you about my baby brother, Simon (also known as "Crazy Uncle Simon" to the boys). Years ago, when Simon was finishing high school, he knew exactly what he wanted to study when he moved on to college: Meteorology. His top two choices, I believe, were St. Louis and Oklahoma, but he wanted to do more than just study weather; he wanted to experience weather. So, he opted for Oklahoma, even though St. Louis showed more interest in him. Early years of chasing for Simon. 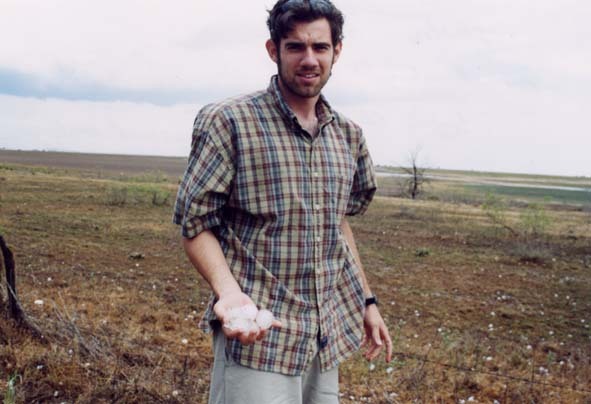 After Simon got out to Norman, Oklahoma (in 1999), he didn't waste any time hooking up with some other freshman meteorologists who were also interested in chasing storms (check out their website here). For a few years, they chased when they were able. Eventually, they realized they could make a little money by licensing video and photographs from their chases. By 2003, I was able to watch Simon's storm chasing videos on the Weather Channel while staying in the hospital when Jonah was born. A few years later, Simon appeared on his first reality storm chasing show. Now, he's finished filming the third season of Storm Riders, which is a hit show on the Weather Channel. No longer a hobby, his day job is to chase storms. 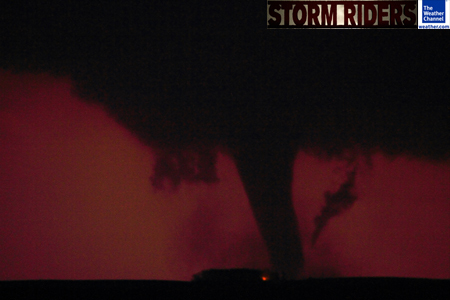 Image from the new season of Storm Riders that begins this August. Simon didn't start off trying to make a living off storm chasing. He just loved chasing and followed his passion with abandon. When writers ask if writing is worth pursuing, I think of my brother Simon. Writing is definitely worth pursuing, but--unless you're going into professional or technical writing--you should be doing it because you're passionate about writing. Everyone wants to live off their writing, and it is possible, but if profit is the only motivating factor in writing a novel, then most writers are going to walk away disappointed. Follow me on Twitter @robertleebrewer. Or connect with me on LinkedIn, Facebook, or Google+. Also, be sure to sign up for e-mail updates over on the right. Twister . Simon now swears he hates this movie, but he used to love it. Twister . This isn't a movie; it's a board game. "There is no end, there is no beginning; there is only the infinite passion of writing. "~Frederico Fellini...ok, Fellini said "life" not "writing" but, hey, close enough for writers! Great posts. I think if you to into writing expecting to make money, you'll become disillusioned very quickly! I think passion is the word of the day when it comes to following one's dream. If one is not passionate, and doing what ever because it will make them buckets of money, life will not be happy for them...work will be a drudge. Writers write because they must, not because they can, in my thinking. It's not the money that drives them, in my opinion, but the need to write. I agree with Jessie. If you write simply to make money, you are writing for the wrong reason. Writing is both learning and sharing. I enjoyed this post, Robert. What a wonderful example! Hurray for Simon and anyone else that pursues what they love to do. This is the problem with the world--everyone equates money with success. I believe success is derived from happiness. Yes, it amazes me how many writers I run across (via e-mail and in person) who treat writing like it's a chore. Sure, it's not always easy, but you gotta love it anyway. I'm a copywriter. I didn't intend to be a copywriter. I was going to be a High School English teacher. Now l'm on the verge of being a 'real' writer - which is to say, not a commercial writer. Follow your heart, and your heart will lead you. That's something I picked up from yoga. It works.